I seem to have slowed down a bit in my reading lately and for that I apologize. Here's what happened: I had been dipping in and out of THE AMAZING ADVENTURES OF KAVALIER AND CLAY by Michael Chabon, juggling some books around, reading this, reading that, reviewing what I liked, as I usually do. But Chabon's book kept calling me back and I'd read a few pages and have to spend time thinking about what I'd just read, adjusting to the fact that a magnificent book had begun to unveil itself to me. Yeah, that happens with certain books. But, here's the rub: I should have been reading it sooner since now the library was wanting it back. I had gotten halfway through KAVALIER AND CLAY hooked to the point that every other book I picked up was suffering by comparison. I either had to read more quickly or I'd miss my own self-imposed review deadline. But KAVALIER AND CLAY is not something you read quickly. It is a book to savor, to think about, to unreel in your imagination scene by scene. It is the story of Joe Kavalier and Sammy Clay, Jewish immigrant boys who, as Hitler rises to power in Europe, transform their own lives through artistry, imagination and hard work. Together they create a best selling comic book world filled with super heroes and raging villains, many suspiciously Nazi-like. A wonderful story that will stay alive in my own imagination, I hope, for years to come. So what is a reader to do when faced with a book that astonishes her senses? With fines adding up at the library (And why or why did I wait so long to begin reading it??? Did I think this Pulitzer Prize winning book would just not live up to the hype? Why was I so leery? ), I had no choice but to return it (after several renewals while it sat there waiting patiently for me to make up my mind). Okay, so here's the plan: I wait a week or so, then I request the book again. Hopefully it will be available to me. But I know that at some point I'm going to have to own a copy. Has this ever happened to you? Have you foolishly dithered over a book only to find that it was even better than you'd dared hope? I'm late to the party I know, but jeez, I'm thrilled to have finally arrived. Isn't it wonderful?! I've read Kavalier and Clay probably three different times, from the library each - I should totally just buy my own copy. Don't dither: Buy the book. You'll love having it to look over for years. It's a keepsake. And you can loan it to relatives and friends and praise it and quote it. OH NO! I've just had a look through my shelves - I was sure I had a spare copy, which I would have posted to you. No luck, I'm afraid, it must have gone to the charity shop. I'm inclined to agree with kathy d. - the expense of library fines etc. might make it worth investing in a copy. And it IS worth it! 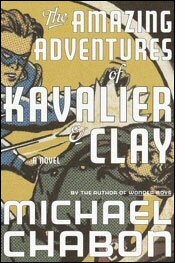 As you know, I love Kavalier & Clay and it's a book that has a great deal of personal significance for me. I think I'll reread it soon. Nicolas: How nice of you...Thanks so much for the thought. :) Yes, I'm LOVING the book. It's a keeper. Didn't think I'd be so besotted with it, but that's the fun of books: you just NEVER know. No question: it is a WONDERFUL book! And I know it meant something special to you. Thanks for encouraging me to read it. Amazon has this book for $5.72 plus $4 shipping for a new copy, less even going down to one cent for a used copy with $4 shipping. And Abe Books has it used for $1 plus $3 shipping. So, when your budget allows, get it, enjoy it. I have heard good things from friends about this book. Thanks Kathy, I am definitely going the 'used' route. Listen to your friends, it is a great book! FYI: After my adventure with Nero Wolfe, Archie and the gang, I started reading "Crooked Letter, Crooked Letter," by Tom Franklin. It's been nominated for many awards. It is very well-written and fascinating, so I recommend it. Finished "Crooked Letter, Crooked Letter." What a beautiful book. Everyone should read this one. A literary mystery, full of understanding of human relationships and what undermines them, and what rebuilds them. A novel of the South. Hope Tom Franklin keeps writing for years. I'll keep reading his books.